Cracked black pepper and dill for garnish. Have you tried any of our fabulous Irish food bloggers trout recipes yet? It’s great to see such creativity and passion for food and we hope you’re enjoying them. This week we’re sharing a recipe from Katia Valadeau from Recession Bites where she shares a tasty lunch or healthy supper salad using the Goatsbridge Smoked Trout. Roast the sliced carrots and whole garlic cloves at 180°C (gas mark 5) for 30 minutes, remove and allow to cool for a short while. Steep the peas in hot water for five minutes then toss them with the cooled carrots and garlic. 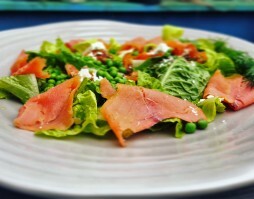 Plate your shredded lettuce first and then layer the carrots, garlic, peas and smoked Goatsbridge trout. Crumble the feta and drop a few mixed seeds on top if you have them. Make the dressing by whisking the the honey, mustard, lemon, olive oil and black pepper together, drizzle over the top of the salad. Enjoy eating it while it’s still a bit warm for added flavour.